Regency's versatile training tables create multiple work environments within the same room. Place the tables according to your needs, conference style, training room, one to one meetings, or let your imagination run wild. Tables are available with locking dual wheel carpet casters for easy configuring, thermofused melamine top, and sturdy 16 gauge steel powder coated painted legs. Regency Cain T-Base Training Table - 72" x 24"
Regency Cain T-Base Training Table - 84" x 24"
Regency Cain tables provide the ultimate in affordability and seating access. This value-priced table is a great solution for most every training or meeting application. Regency Kobe tables provide the ultimate in affordability and seating access. This value-priced table is a great solution for most every training or meeting application. 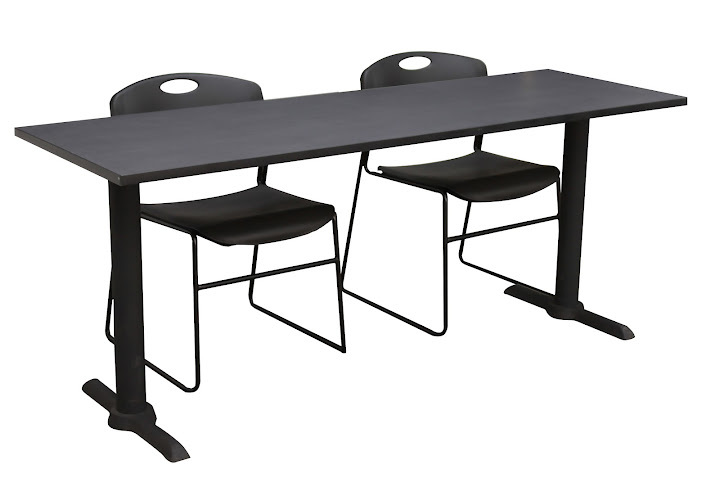 Regency Kobe T-Base Training Table - 42" x 24"
The OFM Stacking Chairs feature modern styling for your conference area, lunchroom or break room. The OFM furniture combines clean, modern lines with stylish accents and a wide selection of tables, and chairs. Regency Kobe tables provide the ultimate in affordability and seating access. This value-priced table is a great solution for most every training or meeting application. Regency Kobe T-Base Training Table - 48" x 24"
Regency Kobe T-Base Training Table - 60" x 24"
Regency Kobe tables provide the ultimate in affordability and seating access. This value-priced table is a great solution for most every training or meeting application. Regency Kobe tables provide the ultimate in affordability and seating access. This value-priced table is a great solution for most every training or meeting application. Regency Kobe T-Base Training Table - 66" x 24"
Regency Kobe T-Base Training Table - 72" x 24"
Regency Kobe T-Base Training Table - 84" x 24"
Regency Kobe tables provide the ultimate in affordability and seating access. This value-priced table is a great solution for most every training or meeting application.